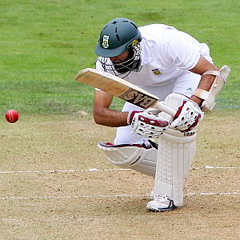 Sydney - South Africa's batsmen got valuable time at the crease ahead of the opening Test against Australia after their three-day match against Australia A petered out to a draw on Sunday. The Proteas, the world's top-ranked Test side, head into the first Test at the Gabba in Brisbane on November 9 with few injury concerns, though De Villiers is nursing minor ankle and back injuries. Fast bowler Morné Morkel was rested for the Australia A match, while all-rounder Jacques Kallis also missed the game to get over a minor chest infection. All three are expected to be included in the squad for the Gabba match, which will be South Africa's first Test at the storied Brisbane ground in 49 years.